My mother, Mary Jane Huskonen (born Dingman), passed along to us the promise that my father, Walfrid Herbert Huskonen, made to himself to be in business for himself by age 45. He achieved that goal when he quit working as a patternmaker at Glauber Brass in Kinsman, Trumbull, Ohio, and founded Andover Pattern Co. in 1952. The first years of the company were in the garage and basement of our house at 496 South Main St. in Andover. Eventually, he was able to build a stand-alone building — the “shop” — for the company on his property behind the house (and behind the cottage had built for his parents, but that’s another story). Yesterday, I found among the various items of memorabilia a newspaper clipping from the 4 Mar 1992 issue of the Pymatuning Area News. It was saved originally by my brother or sister and passed along to me a few years ago. Andover Pattern may not maintain as high of a profile as other industries in the village, but they have been a staple of the area economy for 40 years. Located at the end of Propsect Street Extension, the company was founded in 1952 by Wally Huskonen [that’s my dad] and Roland Totten. The pair had been working together at Glauber brass Company in Kinsman when they decided to open their own shop on South Main Steet in Andover. At first the entire company consisted of Huskonen and Totten, but it has now grown to eight full-time and two part-time employees. After Huskonen died in 1966 [actually 2 Sep 1965], Totten purchased the other half of the company [from my mother]. Today it is operated by his son, Tom Totten. In 1983, the company expanded and relocated to their present location. The company produces cast iron molds that are used by a variety of manufacturers. They do tooling for retred tires for Goodyear, make the molds for lamp bases, make molds for bed frames, and they produce a variety of molds that they don not know the final function of. To get a finished pattern, a piece must move through three departments — pattern, molding, and the foundry. 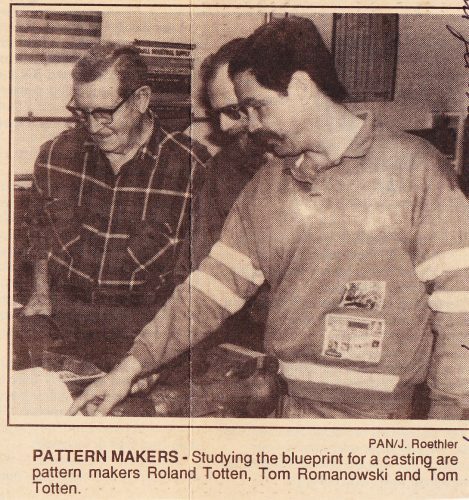 In the pattern department one of three pattern makers emplyed by the company will use blue prints to produce a wood pattern. Using plaster, rubber or plastic, the pattern maker will then use the wood pattern to create [a] master pattern. The master pattern is sent to the molding department where a molder will create a same mold of the object before sending it to the foundry. Once in the foundry, molten pig iron is poured into the mold. After given time to cool down, the cast-iron mold is near completion. The casting is sand blasted before final machining. No finished produces are actually produced at Andover Pattern. After the casting is complete, it is sent throughout the United States, Canada and Mexico to the manufacturer who will use it to mass produce the finished piece[s]. Totten said it requires 6 to 8 weeks to take a molding from a blue print to a completed casting. The Tottens are long-time residents of the Kinsman area. Tom lives in Fowler and his father in Kinsman. Everyone they employ is also from the immediate area. Employees come from Andover Village, Andover Township, Williamsfield, Wayne, and Kinsman. Andover Pattern will be upgrading their iron furnaces this summer. The present gas furnaces that produce a half-a-ton of iron each hour will be replaced by an induction melting furnace that will double their capacity. It would be a mistake to confuse quietness with inactivity at Andover Pattern. My grandson, Korey, wrote about his great-grandfather, Walfrid, in a family history writing competition sponsored by the Western Reserve Historical Society. I posted on this blog about it under the title “My Grandson Wins Family History Writing Competition” on February 4, 2013. I invite you to go to that post and read some more about Walfrid and Andover Pattern Company. 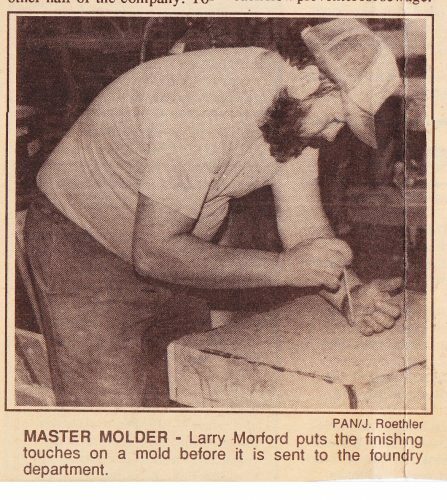 I plan to post more about my dad and Andover Pattern Company in the future. Enjoyed this bio of Uncle Wally. I remember going out to the shop, & walking in the woods behind it. I think Ned worked for Wally for a time. I can picture the driveway out to the shop, but don’t remember the cottage. Congrats to Korey on a well-written piece. Best wishes for future success! Yes, Betsy. I remember that Ned worked for Dad at the pattern shop. I will be getting in touch with him for recollections.